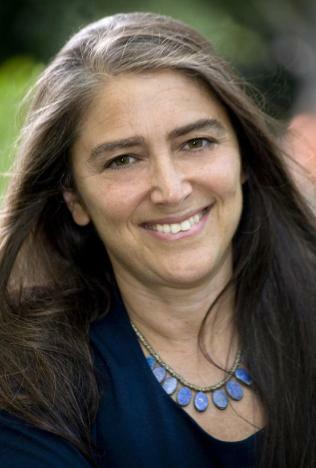 Alice Eve Cohen is a solo theatre artist, playwright, and memoirist. Her memoir, What I Thought I Knew (Viking, 2009) won the Elle's Lettres 2009 Grand Prix for Nonfiction. She has written for Nickelodeon, PBS, and CBS. Her plays have been presented at theatres throughout the country, and she has toured her solo theatre works internationally. Her writing about arts in education has been published in nine languages. The recipient of fellowships and grants from the New York State Council on the Arts and the National Endowment for the Arts, she holds a BA from Princeton University and an MFA from The New School. She teaches at The New School in New York City. Thank you for this interview. Before we start, can you give readers a list of places they can find out more about you? At pivotal moments throughout the memoir, there are short sections titled “What I Know.” In the book, whenever I try to make sense of overwhelming and mystifying events, I make a list of everything I know. But time after time, I find out that the “What I Know” list I’ve come up with is utterly wrong. With twenty-twenty hindsight I realize that what I thought I knew was based on long-held false assumptions. At the end of the book I finally get it right. I think most people who go through a time of crisis re-evaluate their priorities, reassess the things they’ve always taken for granted, question the things they thought they knew. My tumultuous journey turned all the “knowns” upside down. 2. There’s a great deal of humor in your book. Given the challenges you faced, how were you able to mine so much comedy? The comedy in my memoir helped me to write the book. It made me laugh and enabled me to maintain perspective. I want the humor to welcome readers into the story. My approach to storytelling is to infuse as much humor into the writing as possible. My preferred survival mechanism is to find humor even in the most painful situations. I look for the story value in scary moments, for the absurdity in intolerable predicaments. I take great pleasure in self-mockery. Humor is an appealing unspoken contract with the reader. Audiences will shut down when offered a journey of unmitigated bleakness; they will join you as a partner if you pave the road with humor. 3: Can you describe your writing process for this book? One day, quite unexpectedly, I started writing again—in absolute secrecy. I spent a year writing with a frenzied urgency, as if under a spell. I had to finish writing the story, or else—I didn’t know what else, but I was sure something bad would happen if I didn’t finish it. I became uncharacteristically superstitious: I was afraid that if I stopped writing for even a day, or if I told anybody I was writing this story, the spell would be broken, and I’d be cursed again with that same demonic and depressing stranglehold of writers block. For a year I didn’t even tell my husband that I was writing the book. That early writing process was something I needed to do for myself, in order to make sense of what had happened, so much of which was still deeply troubling to me. Then I was able to edit, rewrite, and turn it into a book. I’m working on a new memoir (working title, MY LEFT EY). It’s the story of three generations of mothers and daughters. Set several years after the events of What I Thought I Knew, my new book is about a family odyssey that turned our world upside-down. I peel away the onionskin, traveling through time to explore resonances between events from my childhood and my family’s tumultuous year. 5. What advice would you give to new or unpublished writers? Find a writing class that interests you. Having the structure of a weekly class motivates you to write on a regular basis; it’s great to get feedback from peers on your work; and participating in discussions of other students’ work is a great learning opportunity. I continue to take writing workshops. It exposes me to new ideas and deepens my practice, both as a writer and as a teacher. 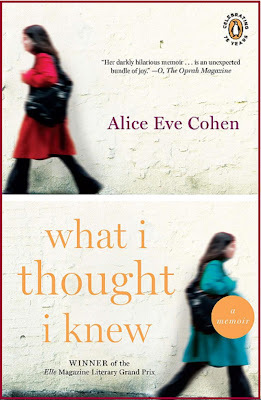 Alice Eve Cohen shares her riveting story in her book, WHAT I THOUGHT I KNEW. When Alice Cohen tried to conceive with her then husband, every doctor she went to told her that she was infertile. Wanting children so much, they decided to adopt a child while Alice kept trying with the use of a dedicated and difficult estrogen course of therapy. This went on for years with no results. Fast forward, and years later we find Alice happily working as a writer, engaged to a gorgeous man 10 years younger than she was, and happily caring for her wonderful adopted daughter. All this when Alice suddenly began to have strange, unexplained physical symptoms. At the age of forty-four, Alice went to several doctors to try and get answers about her bloating and other symptoms. The diagnoses ranged from menopause, age related muscle loss, and other bizarre results until finally Alice was even ready to hear cancer rather than stay in the dark. Well, the light came on with great brilliance as she was finally correctly diagnosed; Alice Cohen was pregnant at forty-four years old! The story, which is short and a quick, but powerful read, moves into second gear as it explains the problems Alice then had in trying to find an obstetrician who would treat a high risk pregnancy such as hers and especially considering her health insurance which wasn’t the best. A doctor who would take on a 44-year-old woman who was 6 months pregnant and had no prenatal care is not an ideal case! During the search, Alice entertains thoughts of giving the baby up for adoption as well as considering an abortion. In the end, she decides to go through with what she believes is meant to be and will accept whatever birth defects or challenges this child might have. In the final part, readers are given an inside look at the final months of pregnancy as she continued to teach one of her solo theatre classes. As a retired teacher, I especially found this part very entertaining even as the relationship with her students had its highs and lows. Finally, the baby is born and Alice leaves nothing to the imagination as she graphically describes the birth. Her humor is at times a bit dark but the realism works so well that it held my interest throughout. WHAT I THOUGHT I KNEW was a book that I related to so much and was able to feel what Alice was going through as she wrote, that I finished it in one sitting. A hard life, some tough choices, a brave woman, and a really good read! +1 ENTRY: COMMENT ON SOMETHING YOU FOUND INTERESTING ABOUT "WHAT I THOUGHT I KNEW" FROM THE INFORMATION "ABOUT THE BOOK" OR "MY REVIEW" ABOVE THAT WOULD MAKE YOU WANT TO WIN AND READ THIS BOOK. +1 MORE ENTRY: COMMENT ON HOW YOU FOLLOW MY BLOG. IF YOU FOLLOW MORE THAN ONE WAY, YOU MAY COMMENT MORE THAN ONCE AND EARN EXTRA ENTRIES. 6 PM, EST, JANUARY 5! I think it is really interesting that it took doctors that long to diagnose her as pregnant. I would like to read the book. I would love to read this because I love memoirs and I like that she was able to find humor even in difficult times. This memoir sounds interesting. I found her comment about her subconscious saying, "This is the story you have to write, and you know it, Alice" very powerful! The subconscious can motivate a person to do something, but it can also hinder a person as well as though there is an invisible glass that a person can't step through. One other comment ... I see on the cover that this book received the Elle Magazine Award. I did some research and found out this book got the award in 2009. The Elle book awarded in 2010 is Emma Donoghue book "Room." I have this book on my shelf to read so if I am the lucky reader to win this one I would have the last two years Elle award winners. Thanks for the opportunity. I'm really interested in finding out about all the medical misdiagnoses! I really liked what she said about "finding humor in the most painful situations. I have never had her experience but went through two times when I took tests to terminal illnesses. The first one was for Multiple Myeloma (a rare bone marrow cancer. Since I already knew that I had MGUS (precursor to MM) I joined a on-line support group and have found that humor pops up quite often in that group. We never know when and if we will cross the line and have the cancer so we have to have humor. That humor strenghens our bond with other support group members and also helps us deal with a difficult situation. Even during the tests like the bone marrow biopsy, and later a lymph node biopsy humor between my physicans, technicans and myself made taking the tests much more bareable. It is similar to joining hands with people and praying that there will be a good result so I say "Hooray for Humor". I am so glad that Alice Eve Cohen has that philosophy. That really makes me want to read her book,"What I thoght I knew". See this link for a giveaway of 'What I thought I knew'. http://bookinwithbingo.blogspot.com/? I follow your blog with Networked Blogs via Facebook. I would love to read this book because her story sounds very captivating. To be told you are infertile and then not only get pregnant at an older age, but to not know that you are pregnant...wow. I would love to here her whole story and what happens at the end and how she gets through it. I watched Alice Eve Cohen's video and it was very interesting (great set up for the story). You can definitely tell she is into performing. It made the video very intriguing to watch. I follow your blog via the Bookin with Bingo facebook group. I follow your blog via e-mail subscription. With the intimacy of a diary and the suspense of a thriller... this is what intrigues me. It sounds like a different type of memoir. I can't imagine what she went through before she found out she was pregnant. I loved the video. It sounded more like a one-act play.I, too, was told I couldn't have kids and didn't need birth control. I was 27 at the time so never was told I was in menopause or anything. Seven years later I was pregnant. Surprise! I would love to read this book - my mom was 45 when she had me and was sick during the time. I liked the interview with Alice and her comments about What You Know are sometimes askew. this memoir looks great- great interview! I love that this is a memoir, and find it interesting that she is sharing such a difficult story with her readers. I find it absolutely terrifying that the medical doctors took so long to find out she was pregnant.I'd have thought this was one of the first routine tests they would have done. I like that she uses humor even in dramatic situations. This book really intrigues me---I am curious how the character in the book deals with that surprise, late in life pregnancy. I had an unexpected pregnancy at age 35 and I am curious if my thoughts and feelings would be similar. I am very interested in reading her memoir that she mentions she is currently working on. Generational relationships intrigue me between mothers and daughters! I also follow by having your blog in my blogroll sidebar. Alice sounds like she went through some tough decisions and challenges! It's what makes us stronger, right? I follower you blog on FB. I love that she's a theatre artist too! I think I'd really like reading this, especially with it being a theatre perspective. Wow! This book sounds AMAZING!! I have wanted to read this awhile, but even more so now after reading the interview and your review. I can't imagine suddenly becoming pregnant at age 44 after years of being told you couldn't get pregnant! I want to read this to find out what happens!! I loved the video! Ms. Cohen sounds like a really nest lady! I adore her sarcastic sense of humor! Sounds a lot like me! :) I like how in both the video and the interview how she tries to explanin how once she started writing, she had to keep going, "or else". I understand this! I have felt this very same feeling (in different circumstances). This book sounds incredible! I really want to read this book now! Thanks so much for the giveaway! BTW- My 2nd post had an error: It says "Ms. Cohen is a nest lady" it SHOULD say "Ms. Cohen is a NEAT lady" Sorry! Is this how you are suppose to record this?